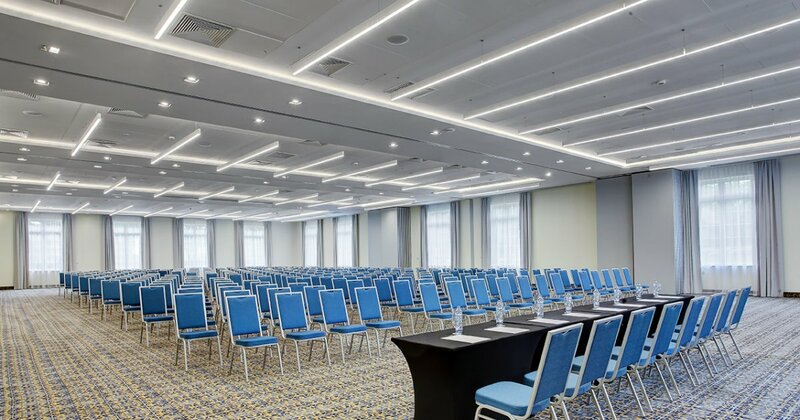 If you are looking for a venue to organize a large event, conference, trade fair, or a small business meeting, we would like to invite you to our Conference Centre. We offer almost 800 meters of space which consists of 7 well-equipped conference rooms. Sala Jurajska A+B+C+D – of the area of 571m, consists of four modules (A, B, C, D). The room can be divided into 3 smaller rooms. It features a convenient access to the entire conference room (from the garden) and the built-in hydraulic ramp which offers quick and easy installation of complicated stage designs. The outside module of Sala Jurajska, which is 3.75m high. Bright and comfortable space with a garden-view.The room is equipped with projectors, screens and audio system. The overlight can be programmed according to the type of event. The outside module of Sala Jurajska, which is 3.75m high. Bright and comfortable space with a garden-view.The room is equipped with projectors, screens and audio system. The overlight can be programmed according to the type of event.The unique feature of Unit D is the built-in hydraulic ramp which can be used to bring oversize items." The room is dedicated to small events, conferences, workshops. It has an area of 101 m2 and it may be divided into two smaller rooms (A, B). Located in a quiet area, from the garden side. The room has the area 91 m2 and it is a perfect choice for small, intimate business meetings, events, and conferences. The room may be divided into two smaller rooms (A and B). The modular system offers free division of rooms according to the space requirements and the type of event. The amazing foyer, with an area of 306 m,2 is a space which may accommodate a support event as well as fantastic exhibitions and vernissages. Our conference offer includes availability of rooms and perfect organization of eventsaccording to the needs. We can arrange banquet and conference tables to suit your requirements and create the atmosphere you desire. All conference rooms are illuminated with daylight. Full overshadowing is also available.